Groups of 15+ receive $1 off admission when paying with a single transaction. Fire wood is included, along with benches and a table. Wooden roasting sticks are available, $3/10 sticks. 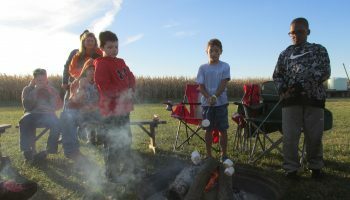 A Ramseyer Farms employee will start the campfire at the designated time. Tent rentals include tables and benches. Limited electricity is available. A campfire site next to your tent can be rented as well. Tables and benches are provided. Limited electricity is available. Bring your own decorations to create a fun and memorable event! A campfire site next to the Little Red Barn can be rented as well. Celebrating a fall birthday? Rent tables for your party in a section of our Birthday Party Tent! See more details below. View rental details and how to book your rental! Celebrating a fall birthday? Rent tables for your party in a section of our Birthday Party Tent! This tent is full of tables available to reserve in sets of 2 or 3. 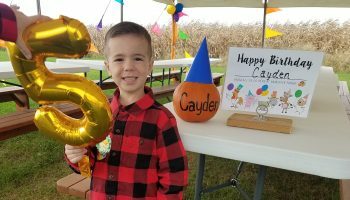 Your tables will be marked, and the birthday person will find a small pumpkin waiting for them as a gift from all of us at Ramseyer Farms! Birthday party guests are welcome to bring table decorations and birthday cake. Enjoy the tasty food options we have available on our festival weekends or feel free to bring your own. There will be one campfire available for all the groups in the Birthday Party Tent to use. 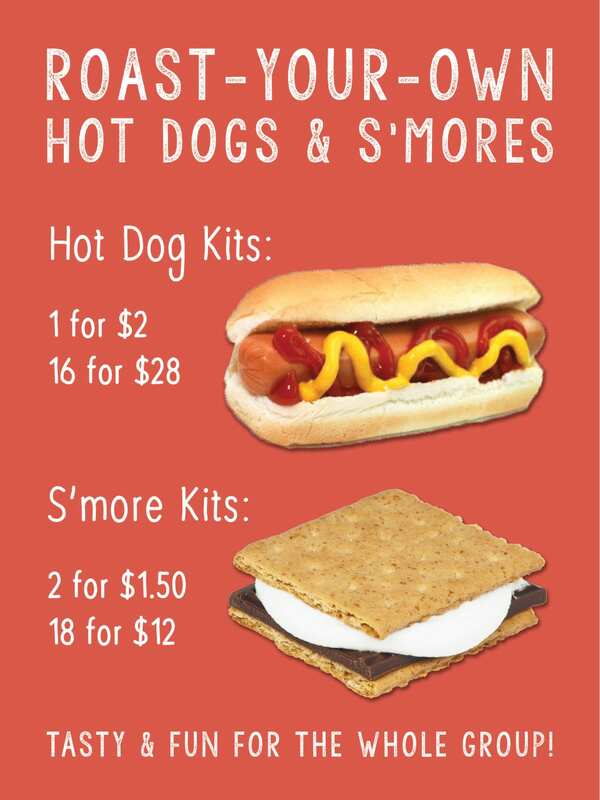 Wooden roasting sticks are available at our Information Booth, $3/10 sticks. 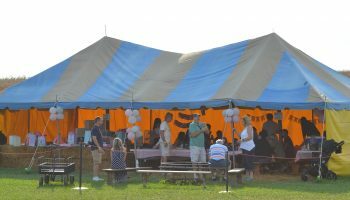 If you will need electricity, we recommend our other tent rentals or Little Red Barn which can accommodate that, as well as provide space for larger groups. Please make rental reservations online here. Check in at our Information Booth in the red barn. This is where you will get your wristbands and be informed of your rental site location. Admission is required for everyone in the group and includes all of our fun fall attractions. View more information on Group Tickets. Your group may arrive prior to your scheduled time (during open hours) to have fun at Ramseyer Farms. Your rental site will be available at your scheduled time. You and your guests may come and go from your rental site, but Ramseyer Farms is not responsible for items left unattended. There is no fee for canceling or rescheduling events due to inclement weather; we will work with you to reschedule the event at a mutually convenient date. Outside of inclement weather, we do ask for a three week notice of cancellation for our tent and little red barn rentals, one week notice of cancellation for birthday party table rentals, and a minimum of 24 hours notice for campfire rentals. If you have questions about our cancellation policy, we encourage you to call us at (330) 264-0264. For safety reasons, we do not allow cars to drive to the rental sites. We do have designated wagons available that you may use to carry food and other items to your site. For groups with large quantities of food/decorations, a Ramseyer Farms staff member will use a golf cart to transport food to your site. Check in with the admissions staff for wagon and cart availability. 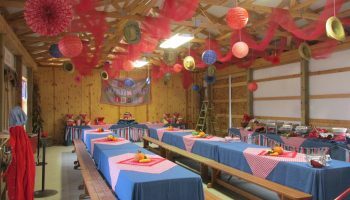 Ramseyer Farms is the perfect place for Company Outings, Church Groups, School Clubs, Scouts, Birthday Parties, Reunions & more!